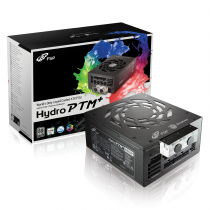 FSP’s latest PSU-Hydro PTM+ is a unique, patented liquid-cooled PSU, created exclusively in cooperation with Bitspower, a renowned creator of liquid cooling solutions for PCs, to meet the industry’s highest security and safety standards. It is the world's first mass-produced liquid-cooled PSU with 80 PLUS® Platinum certification, including gorgeous LED lighting to ensure that your systems will always stand out. The unique liquid cooling system, once enabled, increases the power rating from 1200W to 1400W while still exceling at efficiency when running in silent mode (below 50% load). It delivers a whopping 600W without the use of a PSU fan for cooling, thus remaining completely silent.